Jim Clemens Collection No.21. 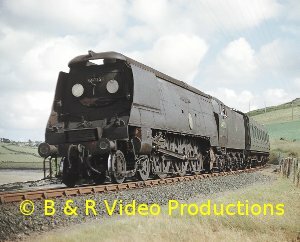 An archive video film of mainly steam on the lines of Devon that includes Western and Southern motive power. Back in Volume 46 we travelled west the Western Way as far as Plymouth. This volume covers the Southern route from Waterloo to Plymouth, a bit like the Withered Arm video really. Along the way we visit various branches like Ludgershall and Bulford before a glorious interlude at Salisbury on a summer Saturday before the diesels came and altered the Atlantic Coast Express for ever. Down to another summer Saturday at Exeter Central via the Seaton and Sidmouth branches. Onto the Withered Arm to Barnstaple and Ilfracombe. A long look at Wadebridge to Wenfordbridge with a Beattie Well Tank even though the 1366 Class had arrived. A brief view of the Callington Branch and finally Plymouth. Plenty of Bulleids but many other types as well on a route that has now changed or closed forever. A real West Country treat of steam. The Western Way takes a journey from Paddington to Saltash but not necessarily by the most direct route. It is primarily to visit the less well covered areas by film cameramen dealing with secondary lines and branches. Gloucester is reached via Reading, after which there is a look at the Chalfont auto service along the Golden Valley. On via Bristol Temple Meads to find Tiverton Junction. 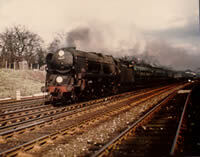 Here, in 1963, a railtour headed by 60022 “Mallard” allowed participants a trip from Exeter via Cadleigh behind two 45xx prairie tanks to the Junction, before visiting the Hemyock branch. 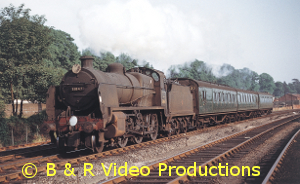 This was worked by 14xx auto tanks and this theme continues for a visit to the Teign Valley line from Newton Abbot to Exeter via Heathfield, filmed in 1958. 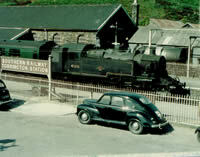 Then a visit to the Moretonhampstead branch also in 1958, Titfield Thunderbolt stuff this, racing the local bus! A branch to survive into preservation was the Ashburton line from Totnes. This is seen in depth, also in 2958, and all these lines in colour. 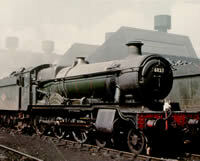 Before the Dart Valley or South Devon Railways came into existence, stock was stored and steamed at Totnes Quay including 6998, 1363 and 1466. Banking on Rattery is seen taking us further west into Plymouth and a shed visit to Laira. 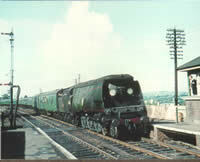 An auto train is used to journey across the Saltash Bridge and visit the station. Steam in and out of Cornwall in the hands of Castle, County and Grange classes. 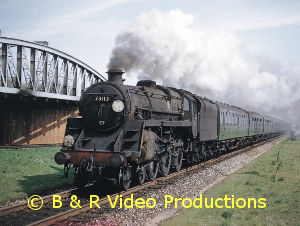 Finally back to Paddington with “Burton Agnes Hall”, “City of Truro” and the last County No. 1011, and Castle and diesel hydraulics at Iver. No. 7025 “Sudeley Castle” arrives under Brunel’s roof just how it was in the days of steam. 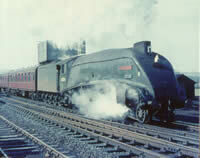 Twenty-five classes of steam, most of them ex-GWR, and the true GWR branch line atmosphere are well portrayed. There is some very rare footage here!. 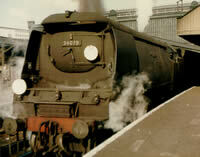 Looks at the events on the Southern Region in March/April 1966 and features 17 different BR and Southern classes. 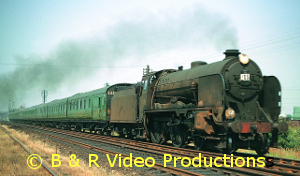 Covers Waterloo to Weymouth main line and its workings plus three railtours. The “New Forester from Eastleigh to Gosport, Fawley and Lymington, with U, Ql and USA tanks. The visit of A4 pacific Kingfisher for a whole weekend for runs to Weymouth and Exeter. 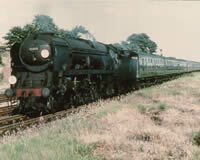 The Wilts and Hants utilised U and N Class moguls and the last run with a Bulleid Ql Class, 33006 from Salisbury. The many main line trains are seen at locations such as Waterloo, Clapham, West Byfleet, Basingstoke, Eastleigh, Southampton and Bournemouth, and lineside in between. 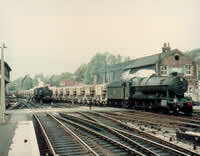 Steam in Kent is seen by way of the steam outpost at Ashford wagon works where a C Class 0-6-0 still worked alongside two departmental USA tanks; others are seen at Southampton Docks.